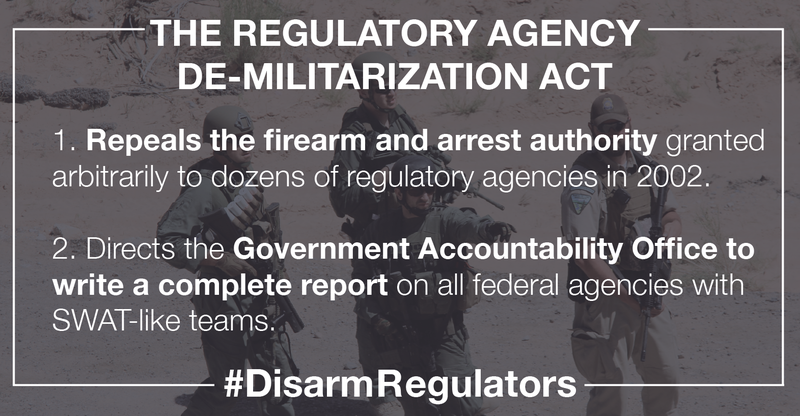 Washington, D.C. – Today, Rep. Chris Stewart (R-Utah) introduced the Regulatory Agency De-militarization (RAD) Act, which stems the trend of federal regulatory agencies developing SWAT-like teams. "It's disturbing to see the stories of federal regulators armed to the teeth and breaking into homes and businesses when there was no reason to think there would be resistance," Stewart said. Original Co-sponsors of the bill include: Representatives Tom Cotton (R-Ark. ), Kevin Cramer (R-N.D.), Sam Graves (R-Mo. ), Tom McClintock (R-Calif.), Mike Pompeo (R-Kan.), Jeff Duncan (R-S.C.), Kerry Bentivolio (R-Mich), Todd Rokita (R-Ind. ), Billy Long (R-Mo. ), Doug LaMalfa (R-Calif.), Adrian Smith (R-Neb. ), James Lankford (R-Okla.), Louie Gohmert (R-Texas), Matt Salmon (R-Ariz.), Tom Rice (R-S.C.) and Mark Amodei (R-Nev.).